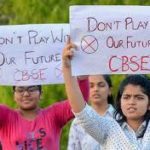 BITSians Protest Against Fee Hike: BITS to hike fees by 15% every year! BITS Group of institutions, which has campuses in Pilani, Goa, and Hyderabad, has recently decided to increase their fees every academic year by 15%, even for existing students. BITS Group of Institutions has always historically kept increasing fees every year (sometimes increasing as high as 25%) as per current students and alumni. 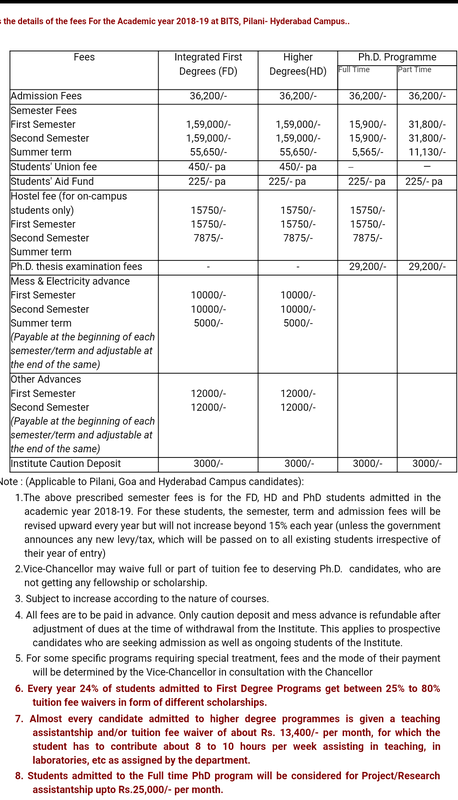 Protesting against this decision to increase fees every year by 15% without any logical nexus between actual development, thousands of students across all three campuses of BITS-Pilani are currently staging peaceful protests, in light of the recent release of the fee structure for the incoming batch of 2018-19. Amidst final examinations looming over them, students of Pilani still showed up in large numbers in the auditorium seeking answers from the Director of Pilani campus. 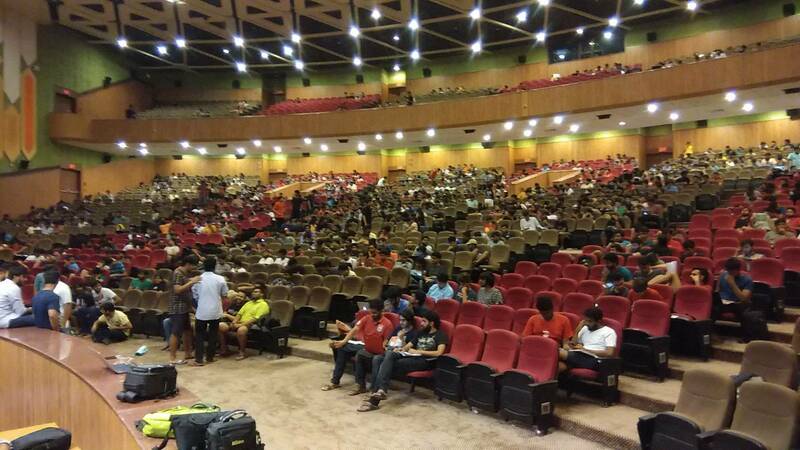 During the interaction, students of BITS Pilani took to Twitter and reported that the Director of BITS Pilani displayed signs of extreme apathy and stated that if students couldn’t pay a 15% hike in fees each year they should go to a government college. The original protests in Pilani campus were supported by similar peaceful movements in Goa and Hyderabad. The Director of Hyderabad Campus along with other senior faculty members also attempted to address the crowd and attempted to answer crucial concerns raised by the students, but were unsuccessful to give satisfactory answers. The Hyderabad Director apparently then promised to get back with answers after due deliberation and discussion with the other members of BITS administration. The protest however continued into the night in the auditorium as students refused to leave without a satisfactory solution. 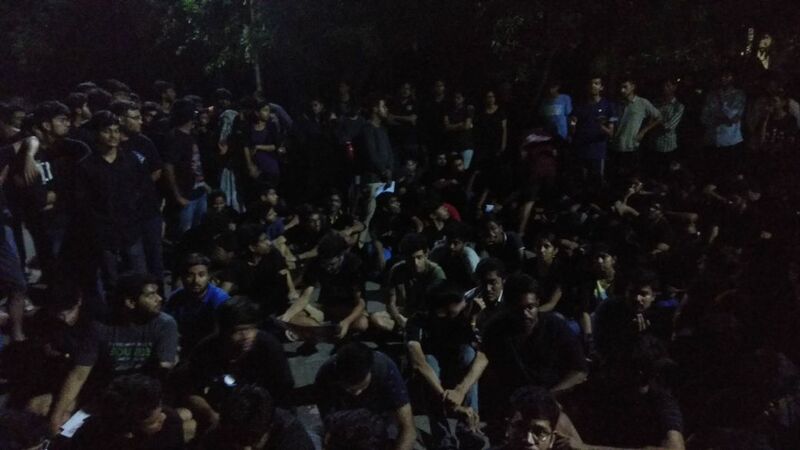 BITS Hyderabad students peacefully protesting in their campus at night. Update 1 (7/5/18): The students have continued their protests well into the next day. Even as their batchmates have been writing exams. Neither the Director nor anyone from the management has spoken to the students further on this yet. 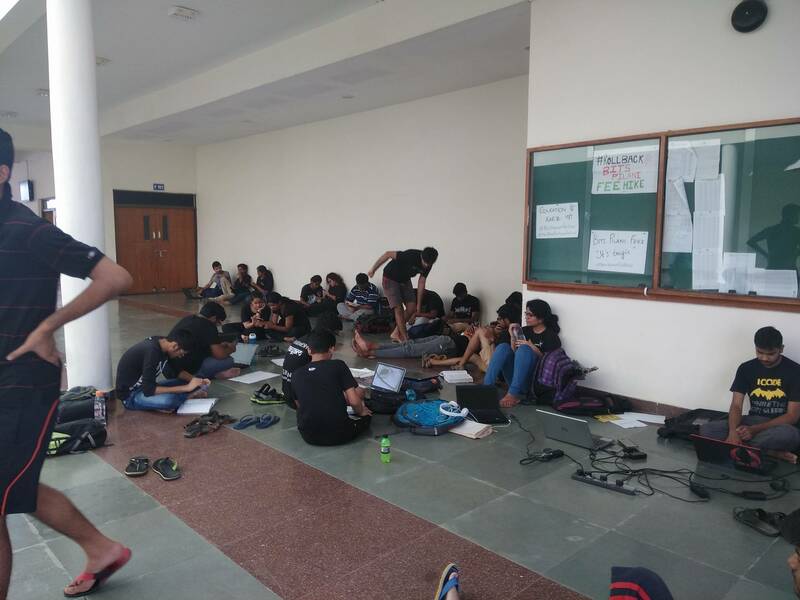 Students protesting outside classrooms on 7/5/18 in response to fee hike notice. Times of India has also reported that BITS Pilani campus was visited by cops to ascertain the law of order situation, despite the entire protests being completely peaceful till now. Students reported that the Police advised the protesting students to avoid blocking the roads during the course of their protests, but not interrupt the protests. BITS Hyderabad students sitting outside the residence of the Director on the night of 7/5/18. Update 9/5/2018: Protests continued on all three campuses with students of BITS Pilani Hyderabad carrying out their protests outside the main gate. BITS Hyderabad students stated that their Director had reached out to them and confirmed that the VC was unwell and was on his way to New Delhi, and that the Directors of all three campuses would meet with the students on today evening to resolve the crisis. BITS Pilani Alumni in Bangalore and Mumbai are organizing meetups to determine how they could help their fellow students. Editors Take: A Private Education institution may have the right to claim that as it does not run on Government subsidies, it should be allowed to raise its fees to maintain itself or develop further. But to demand a 15% hike each year (or any amount of hike for that matter), the Universities are answerable to the students. Providing education to students is not a favor that is being done by private universities, but is a service being rendered in exchange for the student’s money. Hence the University is answerable as to why must it increase 15% each and every year, where is all the money going, and how will that money help the future of the students? The money paid in terms of fees to a University by a student is in the hopes that the University aids the student’s future prospects and helps him/her achieve their career goals. And the students are completely right to protest when there is an increase in fees without any development or added positives or clear agenda to provide the benefits the students needed. That aside there is no logic for a fixed 15% increment of fees every year as such as this was not there before.